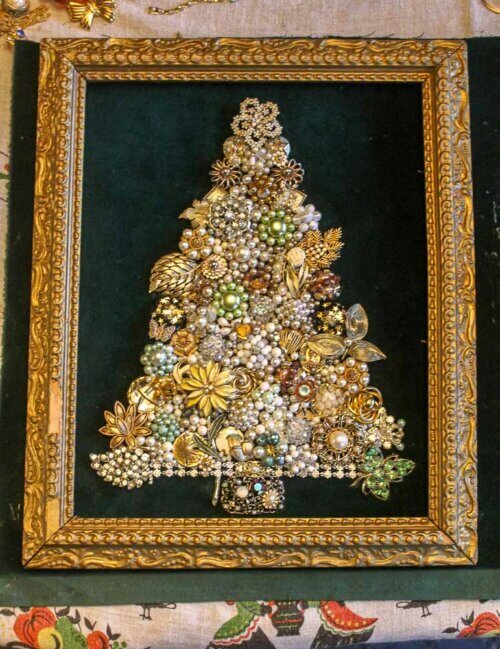 Home » Holiday » Bucket list: I make a vintage costume jewelry Christmas tree — get my tips! Bucket list: I make a vintage costume jewelry Christmas tree — get my tips! 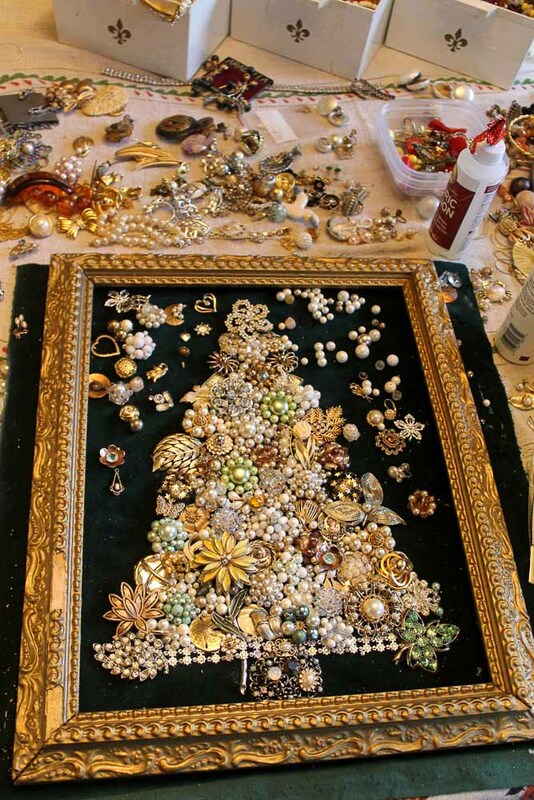 I’ve been collecting broken vintage costume jewelry for several years — with the goal to make a lifetime-achievement crafty: A costume jewelry Christmas tree. This weekend I gathered all my supplies, took over the dining room, and got down to gluing. This project was not easy — like making ornament wreaths, it’s another effort in juggling colors and shapes in three dimensions — made all the more stressful by the fact that it takes a lot more jewelry than you think. That said, I’m pretty darned happy with the result! Voila! My weebit has a new mommy-heirloom! Start by reading my DIY story from earlier this year (it includes the glue I used): Making art from broken costume jewelry. Jewelry pliers or a set of very wide tweezers are important to have on hand. Note: Links to Amazon net me a wee commission if ya end up buying something. 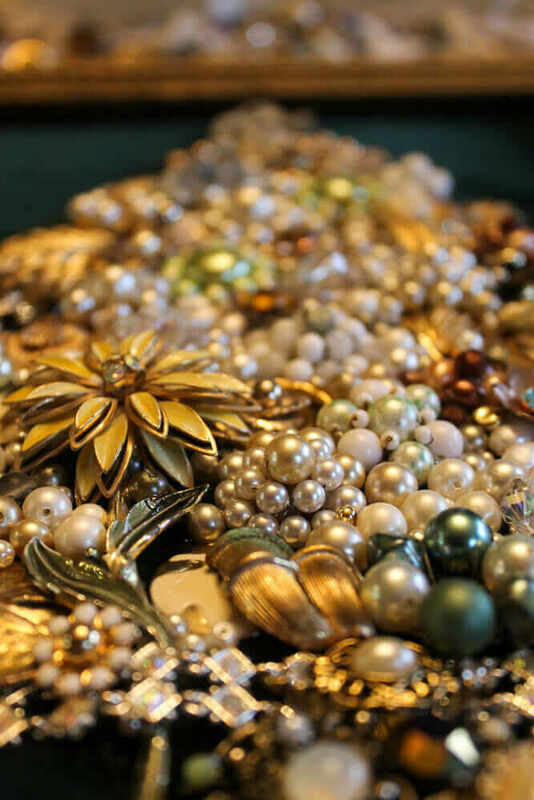 Golly, you never knew how handy it would be to have so many old broken pearl necklaces in your stash. I find these at most every estate sale. 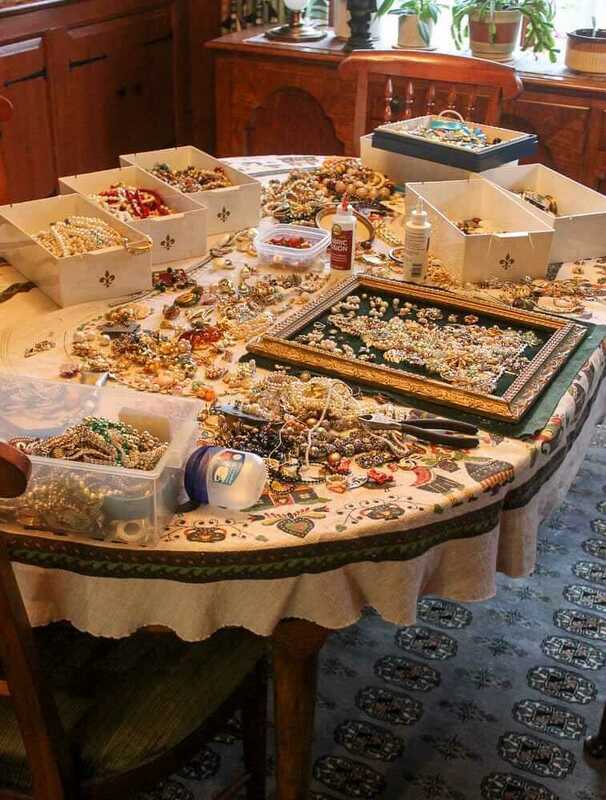 Use the pearls — all sizes, all designs, all colors and sheens — to fill in the in-between spots. I thought about it first and decided I preferred to not have a “straight” edge to the right- and left-hand sides of the tree. I think it’s more interesting that way. To start, I created my “outline”. Then, I filled in from there. Think about your colorway: I wanted the tree to be primarily gold. But then, I realized that I did not have enough jewelry — big pieces — to fill in the tree. So I began to add light green, which I thought worked well because gold has some green in it. As you go, keep scanning the tree clockwise, starting at the bottom left, to ensure you are creating focal points, combining colors, “breaking your edge”, and then “building up” in a way that keeps your eyes moving — in way that gives the piece visual dynamism. Take it slow. I came back to my wreath probably 10 times over three days to keep working on it. I’ll bet that I worked at least 10 hours on it. My goal-mode when I do projects like this is to Enjoy The Process. So I take my time. It’s cheaper than therapy. Next: I am going to paint up the frame a bit more, and probably add some bling to it, too. And, I will reorganize all the jewelry left into colors and decorative pieces so that I can assess what I need to look for in the coming year as I prowl estate sales. Throw out all my rules — and make your own! Costume jewelry Christmas trees from previous holiday uploaders. Your vintage jewelry Christmas tree is stunning! While I appreciate the instructions, I know mine would never turn out as beautiful as yours. Any chance you this tree or a similar one is for sale? Hi Julie, thank you! Mine is not for sale, it’s already ensconced as a family heirloom. I suggest you head to etsy.com — there are several/numerous designers making these, many are quite gorgeous. Tip: Look for great composition — and be willing to pay because quite often, you get what you pay for….